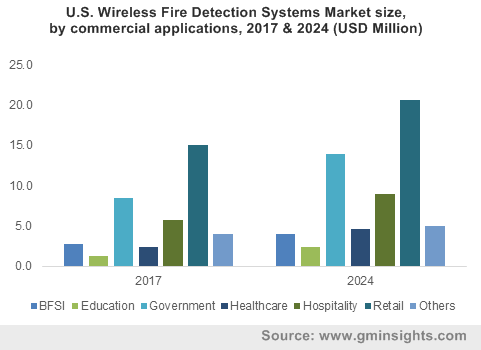 Wireless Fire Detection Systems Market « Global Market Insights, Inc.
Owing to the rapid adoption of smart technologies such as IoT and Big Data, wireless fire detection system market share has witnessed a remarkable uptick of late. The convergence of integrated solutions coupled with a marked increase in the deployment of advanced fire detection systems would further augment product demand. Apparently, the new-age systems offer enhanced aesthetics by eliminating the need for drilling holes and cabling requirements, prevent the utilization of asbestos, and provide ease-of-installation. Subject to this, technology providers have focused on developing advanced fire detection technologies so as to ensure security and safety in new construction projects, that would consequentially aid wireless fire detection system industry. Elaborating further, it has been observed that periodic revision and streamlining of fire safety standards is a crucial factor to have influenced the overall wireless fire detection system market trends. Moreover, numerous developing nations have been concentrating on constructing smart cities to sustain and reenergize their economies. Apparently, the seamless functioning of these smart cities would require stringent enforcement of enhanced fire safety codes. One of the major organizations that has contributed immensely toward drafting improved safety standards in wireless detection system market is the Occupational Safety and Health Administration (OSHA). Being one of the foremost agencies of United States Department of Labor, OSHA has time and again laid out stringent regulatory guidelines with regards to fire safety that has been mandated to be complied to, especially in the construction sector. In the US, OSHA’s regulatory directives such as 29 CFR 1910.160 and 29 CFR 1910.164 have acquired increased prominence given that they are strictly required to be complied with while installing wireless fire detection systems. European Union’s popular directive, named as EN54 Part 25, is predominantly known for outlining the precise safety requirements and laboratory tests for components utilizing radio links across wireless fire detection system industry. Apparently, these directives consist of detailed guidelines pertaining to heat detectors, smoke detectors, voice alarm control and indicating equipment, alarm transmission and fault warning routing equipment, point fire detectors which use carbon monoxide sensors, etc. Concurrently, the swift advancements being observed in networking infrastructure coupled with the aforementioned robust regulatory structures is certain to impel the wireless fire detection system market over the ensuing years. Meanwhile, it would be prudent to mention that the wireless fire detection industry share, which can be termed as being in the nascent stage, has been marred with a few obstacles in the recent times. Subject to various vulnerabilities of wireless infrastructure and the high cost of fire detection systems, the end user segment appears rather apprehensive with regards to adopting these systems on a wide scale. However, owing to the incorporation of cutting-edge technologies in these systems, numerous household safety device manufacturers have been unveiling convenient and smarter consumer products in wireless fire detection market. For instance, Samsung has recently teamed up with Vodafone to provide a range of smart home products with a special focus on security devices including multipurpose sensors, home alarm assistant, and security cameras. Reportedly, the users would receive alerts on their mobile phones in the event of fire at their home. Needless to mention, the launch of such innovative solutions would undeniably propel the wireless fire detection system market size. With the development of smart cities across numerous countries complemented with a robust regulatory framework in place, the commercialization prospects of wireless fire detection system industry appear to soar new heights in the near future. In fact, as per a research report by Global Market Insights, Inc., the overall remuneration portfolio of wireless fire detection system market is estimated to exceed USD 500 million by the year 2024. This entry was posted in Electronics and Media and tagged Call Point, Component, Dual Sensor, Fire Alarm Panel, Fully Wireless, Gas Detector, Heat Detector, Hybrid, Input Module), Installation Type, Ionization, Model, Multi-Sensor Detector, New Installation, Output Module, Photoelectric, Retrofit, sensor, Smoke Detector, Wireless Fire Detection System Market, Wireless Fire Detection System Market Share, Wireless Fire Detection Systems Market.